drycliftdays: Dell Project survives storms, landslips! Dell Project survives storms, landslips! A DCSCA-led consortium that was formed to revegetate the land near The Dell's new Lookout has announced a new plan for the area. The original revegetation project featured a Community Involvement Day intended to teach around 130 local primary school students (plus parents and teachers!) about environmental stewardship and sustainability. Scheduled originally for June 22, bad weather forced its postponement to August 24 and then, days before the re-scheduled Community Involvement Day, a land slip in the slopes that make up the amphitheatre of The Dell opened cracks in the cliff-edge above The Dell. It appears that the land slip is associated with recent heavy rain. 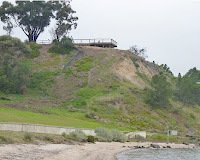 The City of Greater Geelong decided that the land slip threatened the safety of anyone below it and cordoned-off sections of The Dell. The DCSCA-led consortium decided that the risk to anyone working in the vicinity of the Lookout was too great and postponed the Community Involvement Day until May 2013. 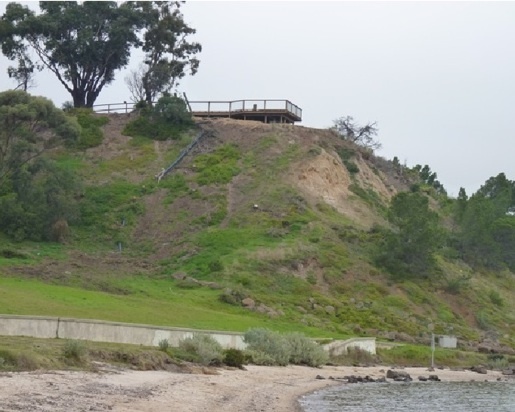 The DCSCA-led consortium received $15,000 from the Commonwealth Government's Caring for our Country Community Action Grants program to plan and execute the revegetation. Consortium members include the Dept. of Sustainability & Environment, Landcare, Bellarine Catchment Network, & City of Greater Geelong.